I had a bottle of water in my bookbag today, because it’s so easy to get dehydrated in this heat. In fact, I’ve been doing this quite often recently. My digital camera and graphing calculator, admittedly both very old devices that were bound to stop working eventually, were also in the same bag. I’m sure you can see what’s coming next from a mile away. Somehow the cap on the bottle of water managed to come undone during the course of the day. So yeah. My calculator’s screen is now too fogged up to actually be visible, and it’s likely that the board is shorted out as well. My camera seems to be under the delusion that the mode switch is set to ‘preferences’ even when it’s not, and the arrow keys move the cursor on that screen in completely random directions. Gahh! Maybe letting them dry off for a bit will make things miraculously work again, as happened with the digital clock that I managed to completely drench a couple years back. My PowerBook, on the other hand, was in the other pocket of the bookbag. It survived, power cord and all. Yay for something not going horribly wrong. Edited about 15 minutes later to add: The camera is miraculously working properly again. Whoa. Not bad, especially for a camera that’s almost 7 years old, heh! The calculator’s screen is still too fogged up to be legible, though. Honestly, I find last year’s easier to read! 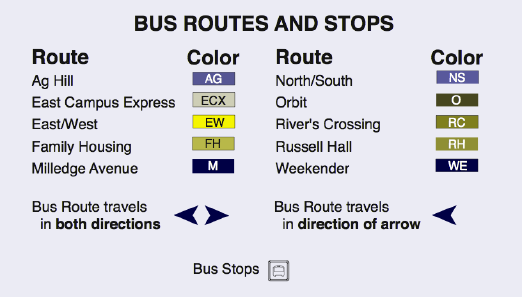 By using one line for several routes, there’s less visual clutter; readability is further enhanced by including the route names, not just color codes, on the lines. I’ve never been a fan of using color as the sole distinguishing factor for things; once you get past a certain number of colors, things get hard to distinguish even for non-colorblind folks. Speaking of which, here’s GraphicConverter’s simulation of how the legend appears to a colorblind rider… oh, the ambiguity!